iMacsoft DVD Maker Suite is all-in-one yet easy to use suite of DVD backup, copy and burn software. The suite offers a available program for you to manage your DVD which includes two powerful products: iMacsoft DVD Creator and iMacsoft DVD Copy. 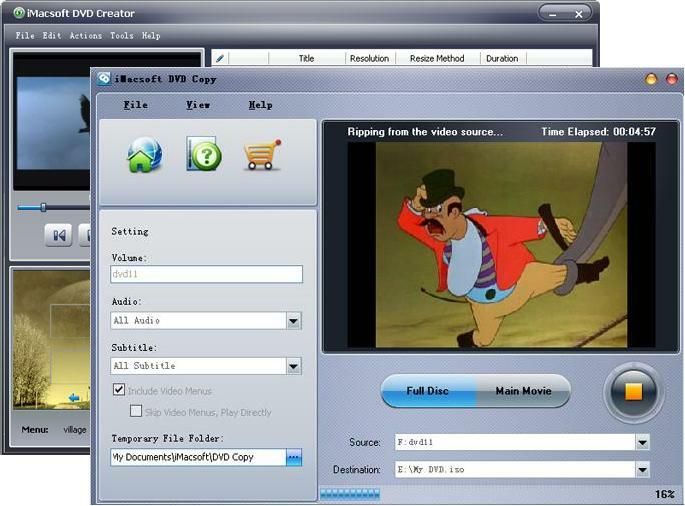 iMacsoft DVD Creator, powerful DVD burner software, can easily convert and burn all popular video files such as AVI, MPEG, DAT, MPG, WMV, ASF, MP4 and VOB to DVD for backup. And even create DVD foler or ISO file from video files on computer. iMacsoft DVD Copy, a best DVD Copying software, can copy D9 and D5 DVD movie collection to blank DVD discs with ease. This DVD Copy supports DVD 1:1 copying solution, you can easily get DVD copies which remain 100% same to the original DVD movie Discs. Moreover, it can compress DVD-9 to one DVD-5 disc. So stable, fast and easy-to-use software for making DVD movies with a low price! Free download iMacsoft DVD Maker Suite and enjoy your favorite movies on your DVD player now! iMacsoft DVD Copy, best DVD Copy and DVD Clone software, can backup D9 and D5 DVD movie collection to blank DVD discs with ease. This DVD Copy software supports DVD 1:1 copying, you can easily get your DVD copies which remain 100% same to the original DVD movie Discs. Moreover, it can compress DVD-9 to one DVD-5 disc. iMacsoft DVD Creator, powerful DVD burner software, can easily convert and burn all popular video files such as AVI, MPEG, DAT, MPG, WMV, ASF, MP4 and VOB to DVD for backup. And even create DVD folder or ISO files from videos on your computer.